Harriet Bailey graduated from Christchurch School of Art and Design with a Diploma in Visual Communications, and worked as a graphic designer. She now lives in Wellington and is freelancing and rediscovering her passion for illustration. 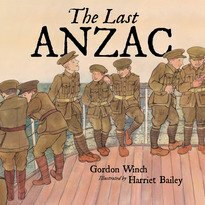 Harriet thoroughly researched the history behind The Great War to ensure her illustrations in The Last Anzac reflect the time.